I was interviewed by Hike Like Woman back in November. The podcast was released and available a few days ago. You can go to Itunes and look up Hike Like Woman. Hike Like Woman, by the way, is one of the many hiking groups I have discovered online. 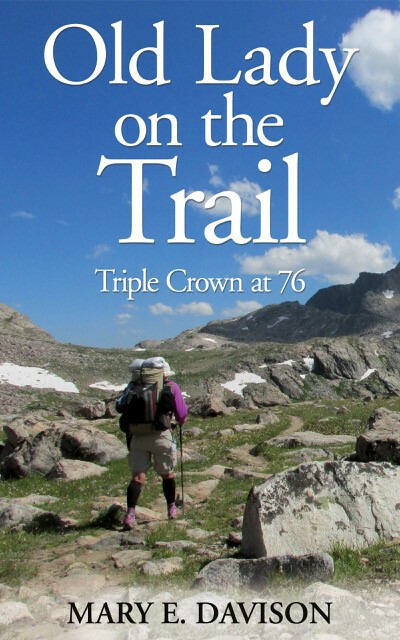 It has chapters in several states and an Adventure Book Club too, which is featuring Old Lady on the Trail along with another book as their books to read and then discuss online in February. I hope you will enjoy the podcast as well as the book. An online magazine called Healthy Aging has also picked me up and published an article about Old Lady on the Trail for subscribers in their winter edition. In the spring the article will be available on their website. Another podcast also will be available sometime in February. I will post information when I have the details. Podcasts are fun. I get to talk about trails I have traveled, one of my favorite subjects. The other note of progress about the book is that it has passed the 4,000 copy mark. Amazing! Personal progress is happening also. I can now walk 2 miles twice a day, and they are even at a half way decent speed for two months post knee replacement – 24-26 minute miles. The new knee likes movement. It still doesn’t like being still. When sitting or standing or lying down, in virtually any position assumed for more than 10 minutes, the knee concludes it should never move again. I swear it talks to me, “What? Why do you want to bend (or straighten)? You left me here in this position. Isn’t that permanent?” “NO! Resting/sitting/standing is not meant to be permanent.” We have an on-going argument I hope to win sometime. No, this is not about religion. But I needed another P word for the title and proselyte was the only one that came to mind. Well, it is a story about someone getting the walking religion. I said, I didn’t know, but maybe she could walk somewhere to see the flowers. “Really?” she responded. What would I suggest she should do? I suggested she start walking to the end of the block and back and slowly add a little bit more every few days. My new walking partner walks with a rolling walker and brings her dog on a leash. She has impressed me with her dedication to this new enterprise. Her pace has picked up and she has added blocks to the first two she started with. She also joined weight watchers and informed me today that she has lost 4 lbs. She is now up to 1.2 miles. Her walker has a seat and she rests part way, but she keeps adding blocks. And she told me this is all because she read my book and met me. I can walk faster than she can but I am quite happy to walk with her (also with my other friend) when either or both are available. I get enough times when neither of them can walk with me to indulge in walking as fast as I can and as far as I can to push my rehab limits. And I can always walk farther than they want to but still enjoy their company until they have had enough. I am thrilled with her progress, my walking proselyte. I am thrilled that reading my book and talking to me inspired her ambition. I am thrilled she has new ambitions and determination to be healthier. I hope to take her to Paradise on Mt Rainier this summer and take her on a path to see the flowers.